The Chinese Panda Gold Bullion Coin was originally introduced by the People’s Republic of China back in 1982. Since then, the coin has garnered a loyal following of collectors and investors from around the world who seek the strike for its 99.9% pure gold as well as its annually changing reverse design of the loved panda. These coins are typically struck in five different sizes including 1 ounce, 1/2 ounce, 1/4 ounce , 1/10 ounce and 1/20 ounce, all of which have been available annually since the series debuted with the exception of the smallest strike which first appeared the following year. In addition to the changing reverse designs, the coin have also featured different face values. Initially the strikes had values of 100, 50, 25, 10 and 5 Yuan struck on them, however, this was changed in later years to 500, 200, 100, 50 and 20 Yuan, respectively. The China Mint has also altered its minting techniques over the years which has resulted in the subject matter on the reverse being able to take on designs of a unique nature. Of course, the reverse always features images of the panda, but with the use of reflection, the China Mint has been able to emulate the black and white coloring of the creatures. 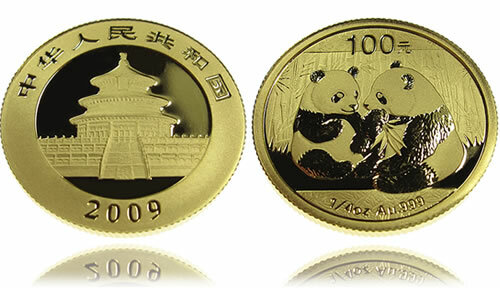 Additional varieties of the Chinese Panda Gold Bullion Coin have also been seen over the years. This includes massive five and twelve ounce strikes which the China Mint produced on a few occasions. Other items to look for are the mintmarks which can include a "S" mintmark for the Shanghai Mint or the "Y" mintmark for the Shenyang Mint. Unfortunately, however, not all strikes minted do include one of those mintmarks. Whether its because of the quality of the gold being struck in each peace, or the fact that the imagery of a panda is always seen on them, these bullion coins continue to be popular with many from around the world, and will likely follow that trend in the years to come.